Probably not, but I'm not sure either an NIT or CBI invite would be accepted. I doubt we make NIT and my assumption is Miles is fired after they lose in the B1G Tourney so any invite would be rejected most likely. I honestly think the only way they play any post season is by winning the B1G. I think they are too far in the hole to even make the NIT. I don't think an NIT invitation is out of the question if the beat Rutgers on Wednesday. Their NET is 52, they are 45 at KenPom, 36 in ESPN's BPI with a SOR of 58 so the computer numbers are good enough. I'm not sure they'd accept a bid, but it could come. Because you don't fire your coach and go to the NIT. We'll decline. Is there a precedence for this? As a season ticket holder Id just like to see these guys continue to play in any capacity regardless of the coach. The sr. deserve it. It's been a tough year. NIT is looking pretty good right now. Probably still have to win the BIG to get in the Dance but who knows? Is there a Husker basketball fan who wouldn't go to a NIT game at the PBA at this point? That's what the NIT wants, a full arena. This was from before today's game, btw. 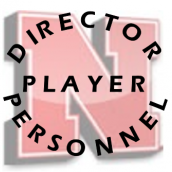 Even with the awful year Nebrasketball had, it is crazy to actually look at their resume. I honestly dont think they get in unless they win the B1G Tournament, but it is crazy to think that if they would have just won two more games in League play, they would have been 8-12... That would have tied them with Ohio State and Indiana(both bubble teams). If they beat Wisconsin, they are at 19 wins. I still think it is crazy to discuss the tourney with how bad this team was in that stretch(2-11). Who knows. I still dont think it happens for us but I am enjoying these last two games. Not going to get to 22 but at least we're finishing strong. A year ago...needed one (or at least one or more) B1G tourney win to make it to the dance due to schedule strength. This year, I don't know what to think after the last week. A win vs Wisconsin today and it keeps getting interesting. I think the NIT is the future for this team and a week or two ago I thought no way. Unbelievable, with our ranking 2 more wins would of got us in. I know those Minnesota/Maryland losses... gut feeling on where we end up in the NIT? Really hoping for a two seed and at least one possibly two home games. But thinking we end up a 4/5 seed. Add the game at Rutgers as games they should have won.